Which loan / debt to payoff 1st? How much time it may take me to be debt free? 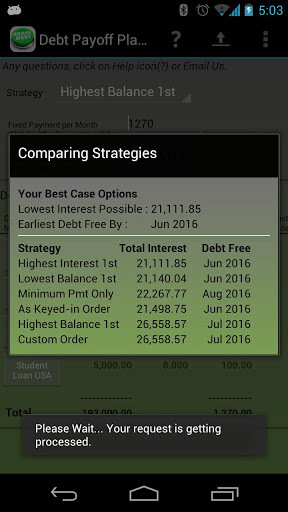 How can I draw my plan to use multiple strategies to be debt free. An option to have a consolidated view of all strategies gives you best case scenarios. Better for you to take Backup of your data and Restore it later whenever you have time. Data cannot be sent or copied out of your Android device to anywhere. So better it is to make sure that you have the SD card in place. On popular demand, it is available for any country, type of loan, credit cards, Debt and still with optional encrypted password protection. Newer How to Prepare FREE for GRE with Ultimate GRE Prep on the Go?